With traditional storage you must buy drives from the array vendor or you're faced with having to struggle with screw and clips. Then after they're deployed, you discover that they're too large or too loud. When capacity runs low or something goes wrong, you often have to be pro-active and use the admin tool to find out what's going on. Drobo makes this all much easier. 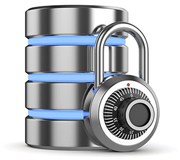 Our RAID makes achieving the redundant protection of your data easy to accomplish. With every Drobo you get the redundant protection of much more expensive storage in a format you don't have to configure or manage. BeyondRAID technology, built into every Drobo, delivers all of the benefits of traditional RAID, but leaves the limitations and complexity behind combining enhanced protection, reliability, expandability, and ease-of-use. Learn More about BeyondRAID Technology. 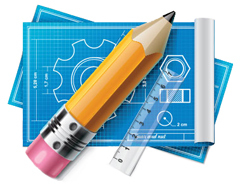 Storage requirements come in many different shapes and sizes. 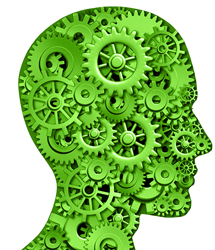 Personal computers, laptops, servers and virtual servers all have different connectivity and access needs. Whether you're directly attached to your personal computer, sharing files with others over the network, or backing up a business application – Drobo has the connection you need and the speed you want. Drobo connects to Mac, Windows, Linux, and server virtualisation systems with ease. 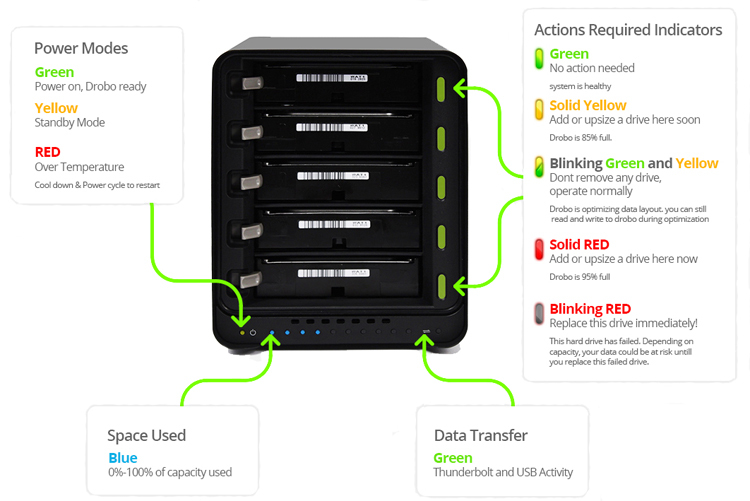 Everyone can take advantage of simple, powerful, and complete Drobo data protection. Insertion and removal of drives in a Drobo can be done while it is powered on and in use, making it easy to replace a failed drive or scale up when you need more capacity – all with zero downtime. Every Drobo has a unique carrier-less design, so there is no need to first insert a drive into a carrier. Just insert bare 3.5" or 2.5" drives into a Drobo the same way you would insert cassettes into a tape deck. No drive carriers or screws are necessary. Drobo has a latch/spring mechanism, making it easy to insert and eject drives. Just hold down the latch to slide a drive in; and to remove a drive, just press down on the latch and the drive is automatically ejected. The Drobo Accelerator Bay on the bottom of the Drobo Mini and 5D works a little differently, but it's just as easy. Bare 3.5" drives are inserted directly into the Drobo. No drive carriers or screws are necessary. Insertion and removal of drives in a Drobo can be done while the Drobo is powered on and in use. It's easy to replace a failed drive and to scale up when you need more capacity—and no downtime. Just plug in your Drobo and rest easy knowing your data will be protected right out of the box. Add disks at any time for additional protected capacity. Drobo can even solve problems by itself. 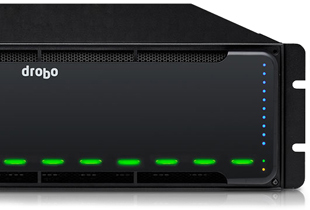 Lights on the front tell you what’s happening – if you can read a traffic light, you’re already a Drobo expert. The primary management interface for a Drobo is the lights on the front of the chassis. Just looking at a Drobo quickly tells you if it's healthy and if enough storage capacity remains. what percentage of overall capacity is currently being used. 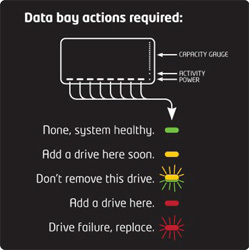 The individual drive status indicators tell you the status of the drives or an action that needs to be taken. For example, if a drive happens to fail, the light for that drive will blink red. If you are running low on storage capacity, an empty drive bay shows yellow, indicating that you should insert another drive in that bay. As you fill your Drobo with data, the capacity gauge starts to illuminate blue capacity gauge lights, ten in all or a blue solid wraparound light indicator on the front of the Drobo Mini. For example, if 40% of the overall capacity is used, four lights or 40% of the wraparound light are lit. Drobo is so simple that the instructions fit inside the front cover. They tell you what the lights mean and what actions you need to take. Drobo is so simple that the instructions fit inside the front cover. They tell you what the lights mean and what actions you need to take. 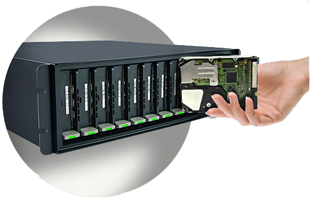 There are Drobos that are designed for the desk, the desk or rack, or just a rack in a server room/closet. Drobos are available in a wide range of sizes and types to best fit your environment.